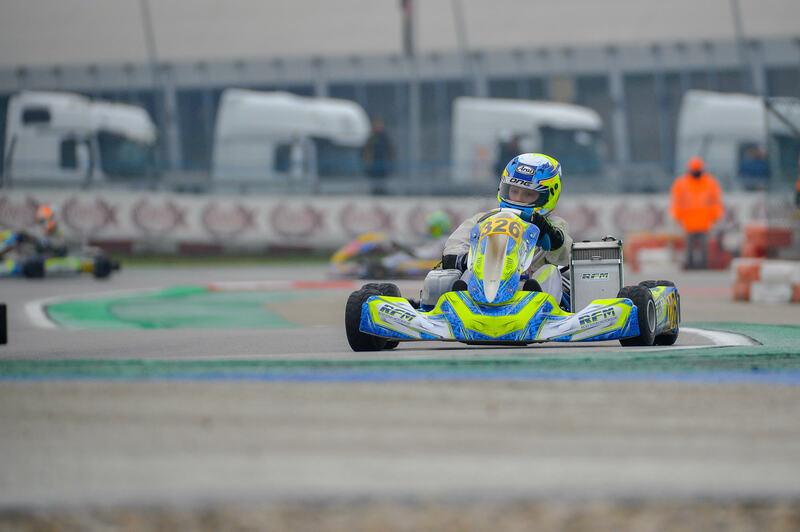 Home Eventi WSK Super Master Series: spettacolari manche di qualifica su pista bagnata. 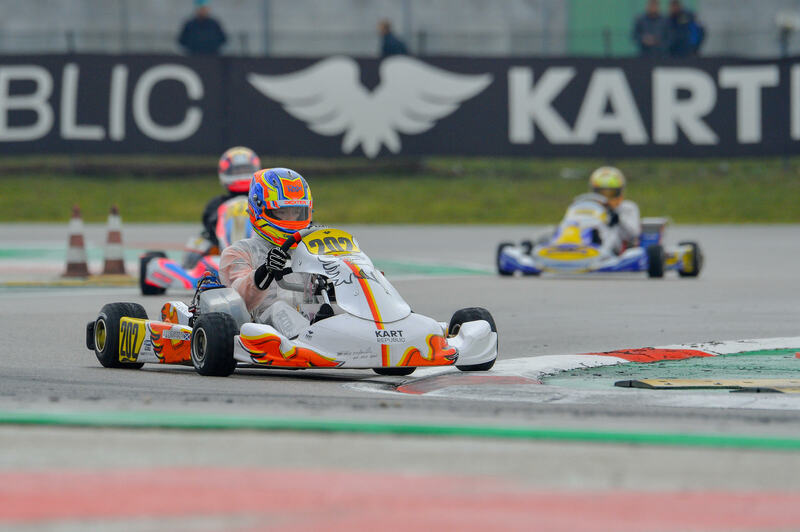 WSK Super Master Series: spettacolari manche di qualifica su pista bagnata. 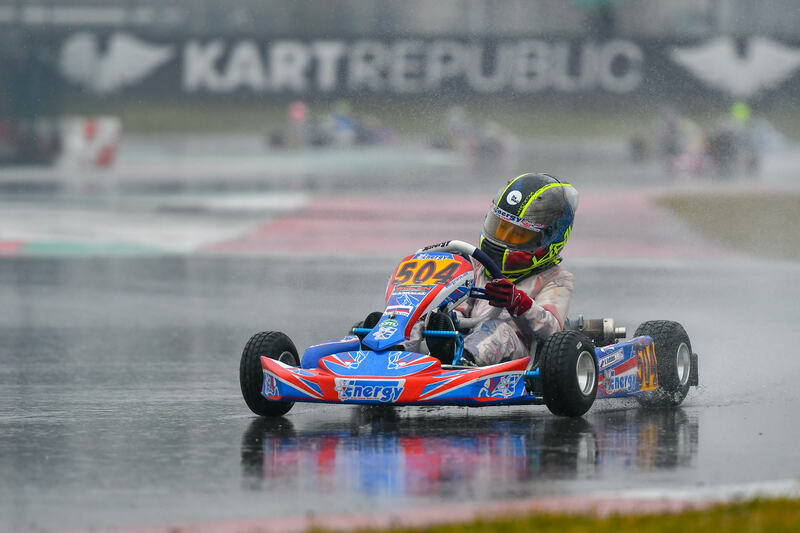 Another day of wet conditions in Adria Karting Raceway for the first round of WSK Super Master Series. This tricky conditions didn’t affect much the show on track, where a very good racing level was shown among the drivers. Dexter Patterson (KR Motorsport) was unstoppable today in both of the eliminatory heats which he contested. In the heat A-C he beat Sebastian Ogaard by almost 5 seconds, the same happened in heat B-C where he beat Dilano Van t’Hoff (Forza Racing). The other eliminatory heats of today, heat B-D and heat A-D the winners were Kirill Smal (Ward Racing) and Gabriele Mini (Parolin Racing Kart), respectively. Actually in Heat A-D was Lorenzo Travisanutto (HT Kart Team) who dominated the heat but a penalty of 5 second allowed Mini to win. So, for tomorrow pre-finals Patterson will be the pole-sitter for pre-final A, while Smal will lead the field in pre-final B. An interesting day in Junior. Yesterday’s crash between Brando Badoer and Nikita Bedrin did not affect their performance. Bedrin won in two heats, heat A-B and heat B-E which puts him in 23rd place. In the other hand, Badoer who is a newcomer in the series managed to dominate heat A-D to classify in 13rd position. Ricky Flynn Motorsport drivers were a must to watch. In heat A-E, Thomas Ten Brinke lead a one-two for the team with Christian Ho second, who then was able to win in heat A-C. The other heats were won by Tymoteusz Kucharczyk (Baby Racie Driver Academy) and Robert de Haan (Energy Corse). Also great performance by Conrad Laursen (victorious in heat B-C), Rafael Camara and Josep Maria Martí who were the most consistent drivers during the day. This consistency has been rewarded with the top3 positions in points. Mini: Kustskov and MacIntyre the kings in wet conditions. In the smallest class was all about two drivers: Russian Kirill Kustkov from Energy Corse and British William MacIntyre from Tony Kart Racing Team. Kutskov was in a class of his own, wining every eliminatory heat except one, heat A-F where it was his compatriot Alexandr Tibekin (DR) who took the victory. MacIntyre also won all the heats except heat A-F.
Today we also discovered the Spanish Adrian Malheiro from Praga Racing Team. The 2018 cadet Spanish Champion won in one heat (B-D), while Manuel Scognamiglio (Gamoto) also showed a great show with the victory in heat B-E. 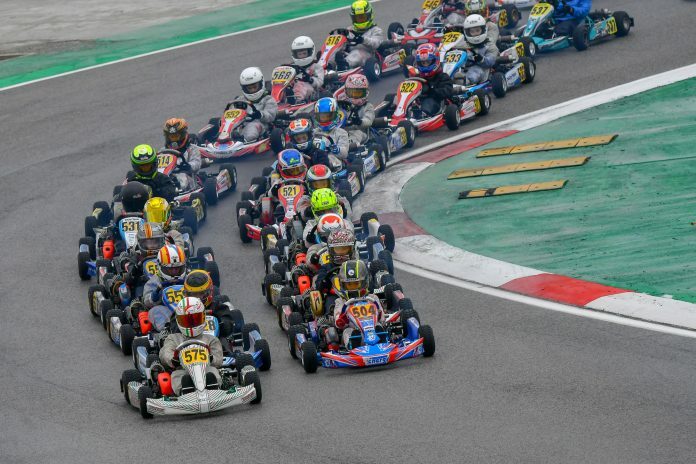 Tomorrow it will be the real competition day, with the pre-finals, finals b and Finals that will give the first points in the 2019 WSK Super Masters Series championship.